I was going to make brownies today, but I wasn't in the mood for that much chocolate (weird, right?) and plus, all we had by way of chocolate was a half bag of chocolate chips. Blondies were what I made instead. I undercooked them a little bit, which was ok, because they taste just like undercooked chocolate chip cookies (with peanut butter), which is a good thing. I love undercooked chocolate chip cookies. Have I said undercooked chocolate chip cookies enough? Anyway, go make these, they're easy, quick, and delicious. Preheat the oven to 350 and butter and 8x8 pan. Mix the butter and sugar, then add in the egg, vanilla, and peanut butter. You might want to heat up the peanut butter in the microwave for a few seconds to soften it so it mixes in better. Stir in salt, flour and xanthan gum, then add chocolate chips. Spread batter into pan, smooth the top, and bake 25-30 minutes. Cool completely before cutting. My hubby and I love blondies...great job! 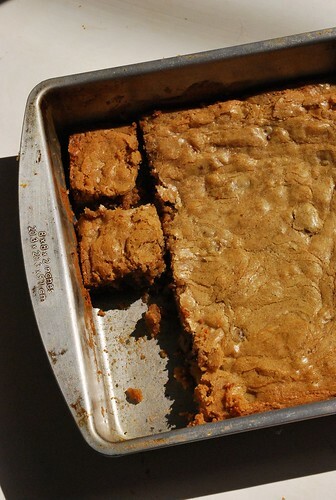 I've seen so many different renditions of blondies lately and am going to have to try them. Your recipe looks so good - I think I'm going to see how they work with almond butter. Cannot wait to try this! I have one celiac child and one gluten intolerant child and they both adore desserts like this! Thanks for the recipe! 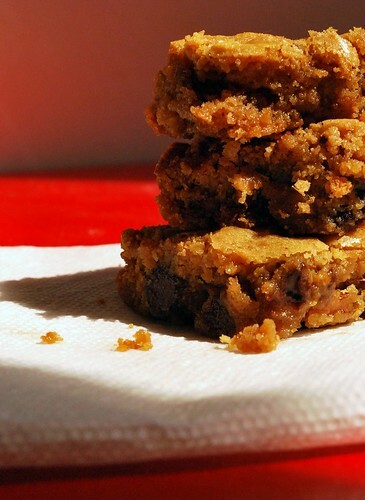 I've made Smitten's blondies before and they are pretty good. Anything with PB for me! The texture looks amazing, so gooey and moist! I honestly just drooled a little. definitely making these! thanks!